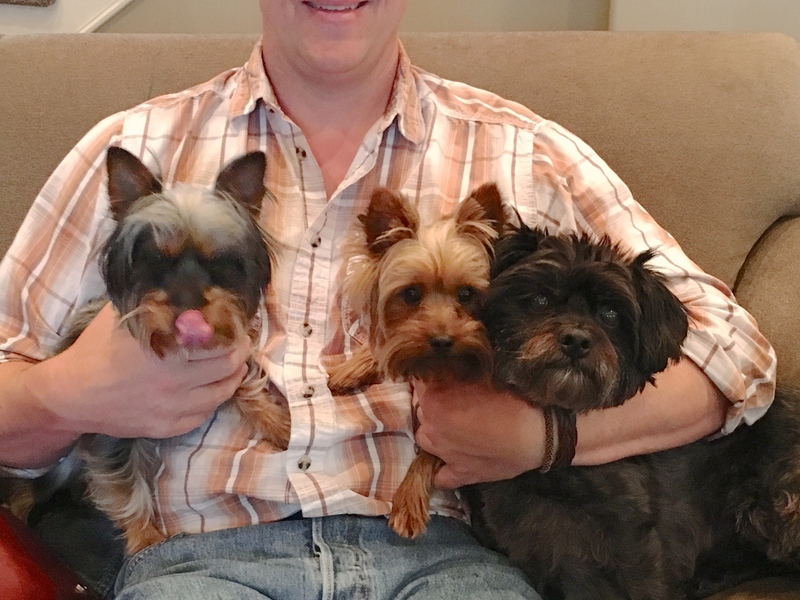 Sadie (left) is a four-year-old Silkie Terrier who lives in Omaha with two-year-old Yorkie Cooper and eight-year-old Yorkiepoo Chloe. Their humans set up a dog behavior training session with us to get them to stop barking, stop Cooper’s accidents in the house and teach Sadie to stop attacking the other dogs over food, treats and some toys. As a dog behaviorist, I usually like to wait and gather more information before starting to identify the problems, but when I arrived for the session, I got a pretty good idea what was going on as soon as the front door opened. When you get any animal this worked up, its going to be hard for them to listen or control themselves. Dogs are reactive creatures by default, and when they live with other dogs, unwanted behavior often multiple and can have a ripple effect through the pack. When I sat down with the guardians to discuss the dog behavior help they wanted most, I learned the dogs didn’t have any real rules or boundaries. While you can get away with this with some dogs, when you have multiple dogs living together a lack of structure can lead the dogs into thinking they need to handle things on their own. This usually results in dogs who consider themselves peers with the humans they live with. But if a dog thinks of you as a peer, then listening to you becomes optional. It also means the dog will challenge you for anything they really want. I initially thought the lack of rules was responsible for Cooper’s accidents, assuming he was marking. But the more we discussed it, the more it sounded like he just needed some remedial potty training. People often assume their dogs see them as an authority figure by default. After all we bought the dog, provide food, shelter, etc. But the dog doesn’t see these things as proof of leadership. We can communicate to our dogs that we are the authority figure by demonstrating it though our actions. Because security for the pack is usually handled by an authority figure, I used the family’s children returning home as an opportunity to show the human how to train the dogs to behave at the door. By increasing the distance from the door before opening it, I was able to lessen the intensity of the stimulus (the kids arriving) which helped the dogs calm down faster and made it easier for them to control themselves. I recommended the family members call or text one another when they are about to get home. This way they can pretend to be a guest and help the dogs practice a new door behavior when guests arrive. I have found most dogs only need 10-15 practices at this exercise before they start respecting the invisible boundary to the door on their own. Shortly after we practiced the door exercise, Sadie went after Cooper pretty good under the couch. It was more ritualized then an actual fight, but was certainly something that needs to stop. I recommended the guardians start enforcing rules and boundaries and add structure when possible such as petting with a purpose. The dogs are likely to resist and push back at first to test the resolve of the humans. But if they stay the course and constantly correct or reward the dogs within 3 seconds, the dogs will start to adopt more of a follower mindset. I asked the guardian to follow up with me in a month or so to make sure this leader follower dynamic shifts. The dog I’m most concerned about it Sadie as she has been getting into it with both Cooper and Chloe as she thinks she is in charge and attempts to correct them when they do something she disagrees with. Those dogs were starting to avoid her as a result and that is not a good environment for anyone. Hopefully the added structure to meal time and the dog’s daily life will help Sadie stop going after the other dogs when she perceives them challenging her. If not, we may need a follow up session or Sadie may need to stay with my pack of dogs for a few weeks to learn and practice more social dog behavior. We wrapped up the session by going over the dog’s roadmap to success. You can watch that in the video below.